Espresso – it’s a machine, it’s a drink, it’s definitely not spelled with an “x”. This method of brewing coffee uses pressurized infusion and dates back to the 1800s in Italy, where it was invented with the purpose of serving coffee immediately. Indeed espresso is the fastest way to brew – the extraction process only takes about 30 seconds and produces (ideally) a strong, concentrated drink with a full body and and a golden layer of foam, called crema, on top. Espresso is made through a machine that forces nearly boiling water under high pressure through ground coffee that has been compacted into a portafilter. The grind of the coffee has to be quite fine, and a wrongly calibrated grind will be obvious in the look and taste of the final product. Espresso can be enjoyed as is but it’s also the starting point for many other drinks – created by adding water or milk (or ice cream, chocolate, whipped cream...) to the shot. For latte art to happen, the espresso shot and and the milk have to be just right. This can make the creation of consistently good latte art difficult for less experienced baristas. It’s a tricky process that requires practice, precision and persistence. Free pouring: pouring directly into the espresso from the pitcher and using certain movements to create different patterns. Etching: using a stirrer to draw designs on the surface of the beverage once milk has been added. Syrups are sometimes used to add details or write words in the froth. Macrofoam: milk frothed into a dry foam with visibly large bubbles that can be manipulated into shapes to create 3D latte art (mostly used for babycinos and iced drinks, and not as commonly as the other two methods). A good espresso shot with crema: crema is the lighter colored layer of foam on the surface of a good espresso. It occurs as a result of hot water meeting ground coffee at a high pressure and emulsifying the oils in the coffee. Crema influences the aroma, flavor and body of the coffee. Velvet smooth, wet foam milk also known as microfoam: created by introducing steam to milk in a two-part process. Firstly, stretching the milk (introducing air), then texturing (mixing that air throughout the milk). Latte art won’t be possible if too much or not enough froth is created. The milk should be fresh and definitely not reheated after prior use! While full-cream milk seems to be a barista favorite for creating latte art, if the technique is mastered all milk types should allow designs to happen. The crema acts as the canvas for the art; the designs become possible when the milk breaks through the crema. 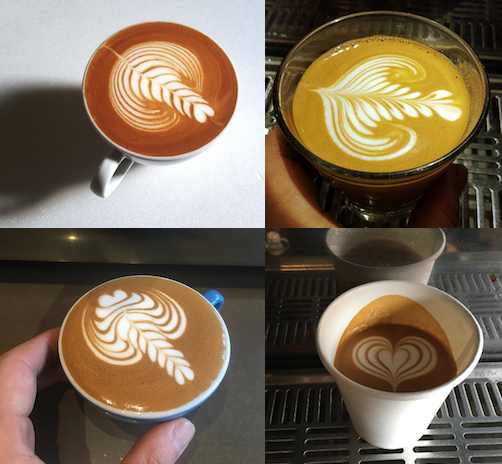 Once these conditions have been met, latte art is a matter of technique: pouring milk at a steady rate while incorporating a side to side movement of the pitcher. The height and position of the pitcher play an important role, alongside the milk flow and movement control. All these factors influence the symmetry, style and overall quality of the latte art. What’s The Deal With Latte Art? In the 1980s David Schomer, a barista from Seattle, ventured to Italy to get some insight into his new profession – having switched from metrology, the science of measurement and a very handy skillset to have in the coffee world! While no one seems to know where latte art first originated, its prominence in the US is credited to Schomer, who figured out how to replicate the patterns he saw in Italy. Schomer’s Espresso Vivace in Seattle, along with a number of fellow Seattle cafes, really kicked off gourmet coffee culture in the US through the combination of exceptional espresso and intricate latte art. Those presentation possibilities have come a long way from the heart and rosetta patterns that Schomer and the Seattle scene became known for and that we all know as fundamental features of coffee culture today. Latte art is the finishing touch on a cup of coffee. The design itself makes no difference to the taste but it influences the drinker’s initial reaction to the beverage. The design should never take precedence over the quality of the coffee and a good barista should be able to get each part of the process right over and over again. These intricate designs disappear quickly, not just because they are gulped up, but because neither the crema nor the microfoam remain stable. The temporary nature of latte art makes it that much more special. 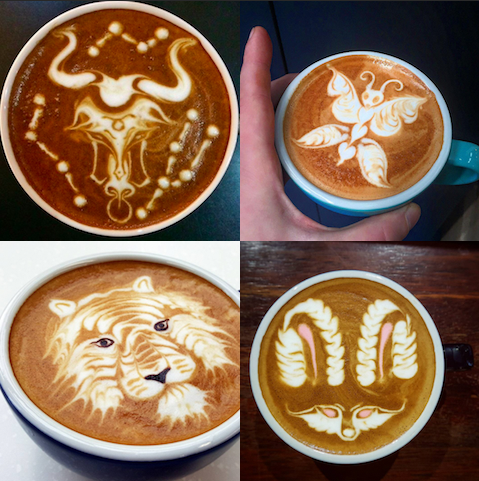 Latte art has become an inextricable part of gourmet coffee culture. There are national and international championships with major prizes, and local throwdowns happen in cafes all around the world. 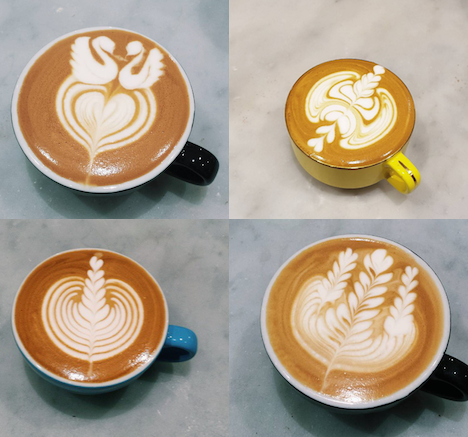 In these competitions, artistic expression is highlighted in a competitive and demanding setting that challenges the barista not only to create aesthetically pleasing designs but to recreate the pattern as well. While some patterns may be happy accidents, the key is to reproduce the designs repeatedly without sacrificing coffee quality. Therein lies the challenge of mastering latte art – a good barista needs to get every step of the process right, do it well, and do it repeatedly. Once that’s achieved, artistic expression can flourish and temporary masterpieces can be created from the beautiful combination of crema and microfoam. Enzo started making coffee while working as a waiter, getting comfortable behind the machine by making staff drinks. Two years later he was in his first barista role at The Hardware Société. Hailing from France, Enzo says, “I was amazed by the heart and rosetta I saw on lattes.” He tried replicating them with the help of YouTube tutorials and was taught the swan pattern by a fellow Hardware Société barista. It quickly became his favorite pour, alongside the triple swan and the kissing swans. “There is always room for improvement as you learn new techniques. I’d like to improve my lines game. There are a lot of people I look up to and try to learn from their pours.” He cites Ben Morrow, winner of this year’s Coffee Masters tournament at the London Coffee Festival, as his biggest latte art inspiration. Enzo says the swan pattern is also a customer favorite as it’s something different to the usual heart and rosetta designs.